...there is a “canonical microcircuit” in the neo cortex, in which information is transformed as excitation spreads serially along connections from thalamus, to cortical layer 4, then to layers 2/3, to layers 5/6, and finally to other brain regions. Each cortical layer is thought to transform sensory signals to extract behaviorally relevant information. 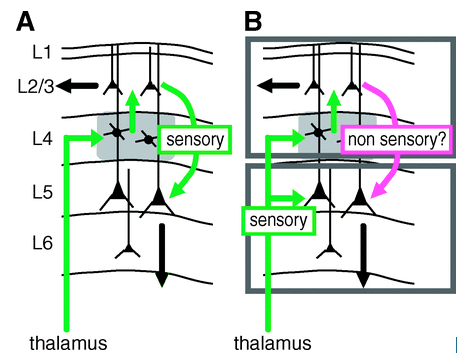 Now, from Constantinople and Bruno...In vivo whole-cell recordings revealed that sensory stimuli activate neurons in deep cortical layers simultaneously to those in layer 4 and that a large number of thalamic neurons converge onto deep pyramidal neurons, possibly allowing sensory information to completely bypass upper layers. Temporary blockade of layer 4 revealed that synaptic input to deep cortical layers derived entirely from the thalamus and not at all from upper cortical layers. This thalamically derived synaptic input reliably drove pyramidal neurons in layer 5 to discharge action potentials in the living animal. These deep layer neurons project to numerous higher-order brain regions and could directly mediate behavior. Workouts at the brain gym. Why does time speed up for older people? An ancestral logic of politics? A defense of evolutionary psychology. The obesity paradox - fat people may live longer! Inflammation links ageing to the brain. A spiritual home for atheists.